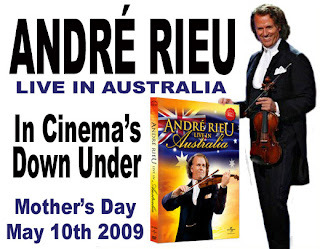 André Rieu in Australia Mother's Day and NEW CD! Australia’s best selling artist André Rieu is returning to Australia in just a few weeks for a special Mother’s Day visit to launch “Live In Australia” on the big screen in cinemas across Australia and New Zealand. André will join host Richard Wilkins on the red carpet at Hoyts’ Entertainment Quarter in Moore Park, Sydney on Sunday May 10th, before a screening of André’s hugely successful Australian concert that took place late last year. However, it won’t only be those at the Moore Park cinemas that will get to see André. In an Australian-first, the red carpet arrival and André’s introduction to the broadcast will be beamed LIVE via satellite to participating Australian metro and regional cinemas. Those at cinemas nationwide can simultaneously watch as André arrives at Hoyts and gives his special message to all Australian fans, before they sit back and enjoy the concert on the big screen in high definition and 5.1 surround sound. Tickets for the live event will include the live 30 minute red carpet telecast, the exclusive ‘The André Experience’ CD, souvenir program and the screening of the ‘Live In Australia” concert. Tickets to the live Mother’s Day satellite screenings will be limited, particularly the VIP ‘Meet & Greet’ tickets at Sydney’s Hoyts Entertainment Quarter, however, encore screenings will be held across Australia following Mothers Day for a limited one week period, where fans can still receive the exclusive ‘The André Experience’ CD, souvenir program and screening. 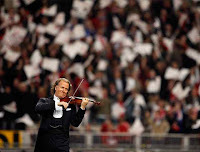 Australia’s best-selling artist, ANDRÉ RIEU, broke all records at the end of last year when his DVD “Live in Australia”, rush-released from his enormously successful debut Australian tour, went 12 x Platinum in the space of 2 weeks. For the second consecutive year he can boast being Australia’s biggest selling recording artist. Sales of his CDs and DVDs are now approaching 2.5 million. 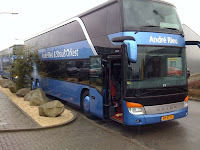 André’s visit will also coincide with the release of his NEW CD “You’ll Never Walk Alone”, songs of hope and inspiration. (ALL New Songs!) To Be Released May 1st! 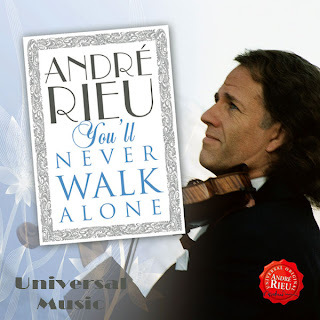 ►Track Listing To "You'll Never Walk Alone"
André Rieu in Cinema's Down Under! 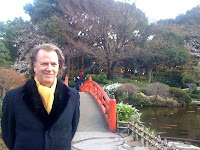 Billboard Lars Brandle March 30, 2009 ~ Dutch classical crossover superstar Andre Rieu will take the cinecasting route to set up his "You'll Never Walk Alone" CD release Down Under, due May 1. Sydney's Hoyts' Cinema in Moore Park, Sydney, will host a red carpet premiere of Rieu's blockbuster "Live In Australia" DVD on May 10 ~ Mother's Day, Down Under. The show will then be beamed live via satellite into cinemas in the Sydney Hoyts Entertainment Quarter, and in Melbourne, Perth, Canberra and Adelaide. Rieu will attend the screening and will introduce the film in each of the four participating cinemas at the Sydney Hoyts multiplex. Hoyts Australia and New Zealand owns and operates 45 cinemas with more than 400 screens and in excess of 75,000 seats. Ticket-buyers for the show will also receive a copy of the "The Andre Experience" CD and a souvenir program. VIP tickets offering the opportunity for a "meet and greet" with the artist will also be sold. Caroline Karsten, Hoyts' digital content manager, tells Billboard.biz that the Rieu experiment is a taste of more music cinecasting projects to come. "The goal of this is to take it the next step and broadcast live events across our chain," she says. Rieu is nothing short of a phenomenon in Australia. Sales of his CDs and DVDs are approaching 2.5 million -- a major achievement in a market of only 21 million people. His "Live In Australia" DVD through Universal Music Australia went 12-times platinum in just two weeks of its 2008 release and has been certified at 21-times platinum (more than 322,000 units shipped to date). The DVD remains at No. 1 on the ARIA Music DVD chart, with two other Rieu titles also in the Top 5. In Braunschweig, Germany. We are going to perform here tonight and we are just beginning the sound check. You travel a lot. Your agenda is booked solid until 2010 with performances abroad. How do you persevere? Going on tour is relaxing to me. When I jump on stage I think: "That's why I do this!". At home, where my office is, I have to work hard. I have to arrange everything and make sure we can still perform in 2012. Does your wife always join you? She never does. That's why we have been married for 34 years. Of course we both think it is tough that I am gone so often, but that's the way it has been our entire lives. She is my right hand. She takes care of the company when I am gone and pays the bills. And when you really are on holiday? That never happens. I hate holidays. To lay around on a beach for two weeks not doing anything, is not my cup of tea. Scrap booking isn't either. The entire orchestra, all the decors and instruments travel with you. How do you do that? It is quite an operation and a challenging puzzle. We transport everything in containers, also the hand made gowns for the ladies. Except my violin, which stays with me. I could not bear the thought of not being able to take my violin as hand luggage. Do you have fixed places when you are on tour? O, yes, when I return to a nice hotel, it feels like coming home. We are with 100 people, far away from home for a long time, so we try to make it as pleasant as possible. I am quite attached to our own buses with our reclining chairs. You are very popular in Australia. How do you explain that success? We perform on stage like normal people, although we play classical music. Australians are also very down to earth people. Maybe that's the reason we click. Do you still have contact with your fans abroad? Personal contact is difficult when there are 30.000 people in attendance for a concert. During the encores they come to the front and after the concert they wait near the buses. Do you go into town after the performance? No. Afterwards we have an after performance snack and a glass of wine. Performing gives you an enormous high. Afterwards we talk and we slowly come back down to earth. I always missed that with the classical symphony orchestra. Orchestra members went straight home after the concert. Do you miss your hometown Maastricht when on tour? From the moment I leave home, I feel sad. But we seldom stay away longer than two weeks. I enjoy seeing the world. It is informative and exciting. Politicians should let youngsters travel the world for two years of their lives so they could study the world and learn each others languages. That would provide more peace on earth. I am not a tourist in the way of sightseeing buildings in Rome, but I want to know the Italians. I just step into normal life. When I arrive at home at 7:30 AM, I might put out the garbage, go to the supermarket or walk the dog. Thank You to John and Ineke for the Translation! 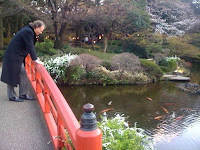 ►I also have such kois at home in Maastricht, but not THAT BIG! NEW André Rieu USA/Canada Tour Concert Tickets Released! NEW Seats Released For André's East Coast Concerts! (I) What is it like to be back here with AJAX? (A) After 15 years, quite exciting. The first time I was here in the old stadium was the very first time I was ever in a stadium. I was downstairs preparing my violin, and it felt like the whole stadium was about to collapse because AJAX scored a goal. It was gigantic, ever since then I am an AJAX fan. (I) A nice evening for AJAX as well as for you? (I) Do you still remember who scored the goals? (A) As far as I can remember, I just heard it from Ivo Niehe, who made the program for me, we can say that Finidi George was responsible for my career. Which in a way is true. (I) In your own words, could you compare your position with that of a coach. You often perform with a large orchestra. Everything has to be correct. Would you want to trade places with Marco van Basten? (A) Now, since you put it that way. My fingers itch when I see what is happening, I am not knowledgeable at all about soccer, but what is important is, that you are the coach, and the role of a coach is to make every one play better than they thought they could, and I think I do that fairly well. (I) What do you think of all the flags you see here in this stadium? (A) I am extremely proud to see all of this. This is where it all began. People still come quite early just to experience the flags. That is very nice and I am proud because of that. That is why I am here tonight. We are very busy and are in the middle of producing another CD, but when Henk called me I said:"I'll be there"
(I) It is an art just to wave a little flag properly. Can you show me how to do it properly? A BIG THANK YOU TO JOHN for translating what this is about for us!! 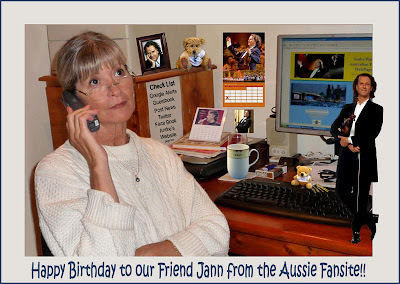 Happy Birthday To Jann on The Aussie Fansite!! André Plays to 50,000 at The Amsterdam Arena Today! 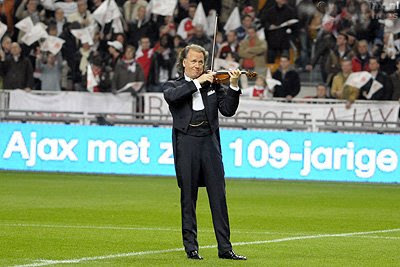 (1) André Waiting to Play at The Ajax/Olympic Marseille Game in Amsterdam today, March 18th ... Then, (2) 50,000 People Waving and Singing to The Second Waltz ~"Goose Bumps!!" Links To Some VIDEO of André Playing! The fan that was taking the second video was obviously waving his flag at the same time, but regardless of the quality, you truly get the feel of the atmosphere ~ Especially when André plays the Second Waltz and 50,000 people are waving and singing. It gave me goosebumps too!! Some of you have been enquiring on how to get the All Access tickets when you have already bought your concert tickets. The Rieu office in New York had read a post in 'Our Guestbook' about it and emailed us with the form that you can fill out in order to acquire the Access Package by itself, without the concert ticket which you should already have. If anyone needs the form you can email me luvberry@charter.net and I will send it to you. Or, You Can Click on this Link Now: Only if you already have a ticket ... then use ► this form to order your Exclusive Access to the Sound-Check and Afterparty. For those of you checking into this, when you click onto the link to André's Webpage that I added above, the form says that the tickets are $1500 each. André's New York office sent us a form where they are $1250 each and he said that is the right price. So if anyone wants the form, just email me luvberry@charter.net and I will send it to you. And here is your glimpse of Dutch violinist Andre Rieu in Ramsay Street. Rieu is a fan of Neighbours and wanted to visit the show while he was on his Australian tour. In a whimsical, romantic scene, Rieu plays the violin for Paul (Stefan Denis) and Rebecca (Jane Hall) in the middle of the street. “The scene expands to others from the street who come out and start dancing, with Steph and Toadie, Karl and Susan. It’s all very cute,” a spokesperson told TV Tonight. Rieu, who is normally in control of his spectacular events, was said to be momentarily thrown by his moment in the soap. “He was incredibly nervous. Right out of his comfort zone.” But he was also very friendly, including eating with the crew in a catering tent in his full tuxedo regalia. A second scene for the waltz king holds another special moment for Rieu and the folk from Erinsborough. “There’s more magic to come,” said the spokesperson. 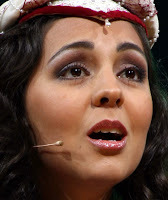 Carmen and Carla Both Will Perform in Maastricht! It's Official ~ Carmen and Carla Both in Maastricht! We all knew that Carmen was going to be performing at the Concerts in Maastricht, but we didn't know if Carla would be or not. 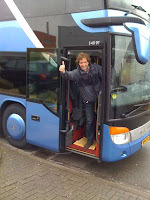 Carla has put it on her Website now that she will be doing all Five Concerts in Maastricht 2009 on The Vrijthof!! ... So we will have all three girls, Carmen, Carla and Mirusia!! 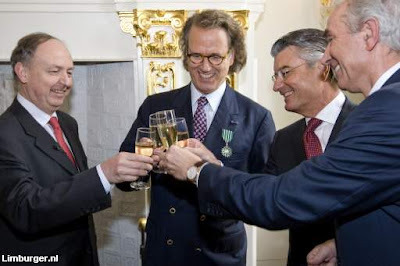 AMSTERDAM Thursday afternoon André Rieu was distinguished by the French Ambassador, and that evening after the Golden Harp Gala, he returned home with the Buma Export Prize of 2009. 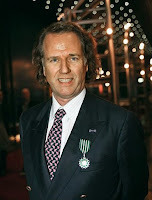 André Rieu received double honors today. He received French Knighthood and the Buma Export Prize. Ivo Niehe admired him because he sold 715,000 tickets. 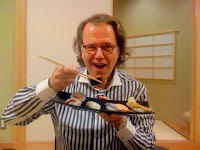 And Rieu himself? "I am extremely proud to be Dutch and a Maastricht citizen. I say that whenever I am on an international stage. We, as a small country, can do it all!" The Export Prize is bestowed upon the Dutch Artist who in the past year has been the most successful abroad. In the meantime this is the fourth time that André has received this award, but that does not make him less happy. "When I started playing the violin, I never thought I would ever win the Export Prize", says André. "I am also extremely proud of the Netherlands. Every evening when I perform I receive so much enthusiasm from the public. Thank you very much!" Thank You to John for Finding and Translating this for us! Appearing on The 'FRONT PAGE' of De Limburger Today! 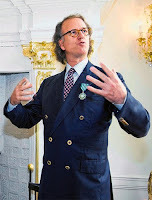 On Thursday afternoon in his own Castle, André Rieu was appointed to Knight in The Order of Arts and Literature of the French Republic. Rieu received this award for his great service to Classical Music. In the presence of the consuls of the Benelux, Mayor Leers and former Mayor Houben, France's ambassador Jean Francois Bradel pinned the accompanying medal on him. Rieu indicated he is honored with the award. He hopes that this award will bring his big wish to perform in the middle of Paris closer to reality. He further pointed out the close relationship he has with France. His family roots date back to the twelfth century in the Auvergne. "When I was there and asked if there was anyone here with the name Rieu, I was told everyone here is named Rieu". The ceremony took place in a Hall of Rieu's Castle. It would have been proper to do the presentation in the kitchen. In this space dating back to 1452, D'Artagnan had his last breakfast in 1683, before he was killed on the battlefield in Maastricht. But the kitchen was too small to receive all the guests and press. The Knighthood in the Order of Arts and Literature of the French Republic is awarded annually to approximately two hundred people, including ten to fifteen foreigners. 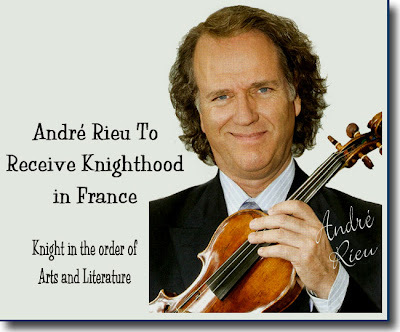 Rieu, following Harry Mulisch, Hella Haasse, Kader Abdolah and Adriaan van Dis, is the fifth Dutchman to be knighted by the French. Various Hollywood Actors such as Tom Cruise, George Clooney, Demi Moore and Meryl Streep have also received the medal. Thank you to John for finding and Translating this for us!! Below is a link with a video of André playing at a French Soccer game on Monday, March 2nd. There's a short interview with him at the end of the video speaking in French. The Video is just below the main video. You will also find these pictures and more on the same Site. RC Lens is a famous football/soccer club in Lens, Northern France. On Monday 2 March Lens played the team Troyes. (the result was a draw 1-1). During the ‘half time’ interval, Andrè played his version of "Les Corons", which is a well known song in that part of France., and has been adopted by the football team as their "Anthem". In the interview he says that he remembered how, 15 years ago he played at the Ajax/Bayern Munich football match in Amsterdam during half time (The Second Waltz) and it was a big success, everybody in the stadium sang along, it was very impressive!. And he hopes that he will make the same impression here, there is always a risk performing at a football match because the spectators come for the soccer and not for me. He has recorded "Les Corons" by Pierre Bachelet on his last album, instantly taking a liking to the music. Thanks to Chris T. for the heads up and Adele for translating the information! 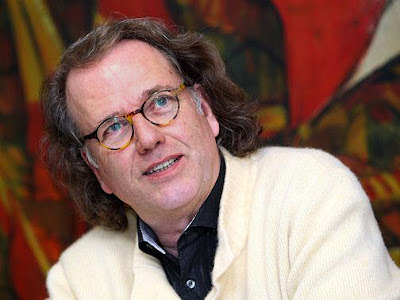 André Rieu will receive a high French distinction. He will become Knight in the Order of Arts and Literature of the French Republic. The world renowned violinist will be presented all the regalia associated with this Knighthood on Thursday in his hometown of Maastricht. 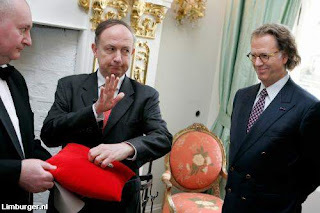 The French Ambassador to the Netherlands will travel to the Limburg Capital to present Rieu with this honor. *Thank you to John for finding and translating this for us! 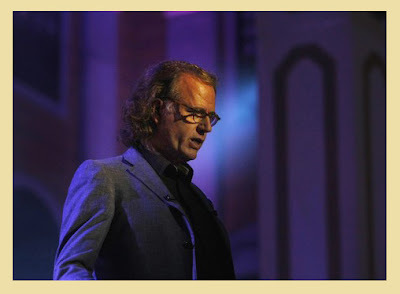 André Rieu's Longest North American Tour Ever! Denon Classics, once again the U.S.'s #1 independent Classical label is celebrating the announcement of André Rieu as the #1 selling Classical artist for 2008 according to Billboard Magazine as well as attaining the #8 spot in Pollstar Magazine among all the touring acts of 2008 in the U.S.! Rieu landed atop this year's sales tally as the nation's top selling classical artist according to Billboard Magazine. He returns to the United States in the Spring of 2009 for an unprecedented "Greatest Hits Tour" celebrating his 30th anniversary as a performer with more consecutive U.S. dates than he has ever scheduled before, spanning April, May and June. To commemorate his artistic achievement and to honor his upcoming 30-year milestone, Denon Classics will release "André Rieu's Greatest Hits" as chosen by his fans and collected from all of his Denon releases on CD, DVD and a deluxe CD/DVD set on March 3rd. André Rieu has already earned the distinction as the #1 pledge drive artist for PBS and now the #1 Classical artist according to Billboard Magazine. Firmly established as one of the top performing artists according to Pollstar Magazine who ranked him as the #8 top touring draw of the year on ticket sales approaching $77 million (placing him in good company amongst the likes of Madonna, The Eagles, Bon Jovi and Coldplay), Rieu has won legions of fans worldwide and his success continues to grow with each new release and tour. Combining unparalleled showmanship with shrewd marketing, Rieu has built a world class musical career with sold out tours and increasing sales of his specials and recordings despite the ever changing dynamics of the industry. 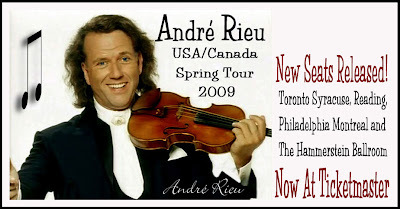 2009 is certain to be another banner year for Rieu with the 30-city arena tour, select repeat airings of his specials on PBS beginning in March and the release of his hand-picked greatest hits collections. Denon Classics' "Greatest Hits" collections include songs and performances taken from all of his hit releases on the label such as "Live in Dublin," "At Radio City," "Live in Vienna," "At The Movies," "Wonderland," "New Years in Vienna," "Tuscany," "Homecoming" and more. "André Rieu's Greatest Hits" will be released as a 15-track CD, a 20-performance DVD and a two-disc limited edition CD with bonus tracks which will also include a bonus DVD with five exclusive performances. 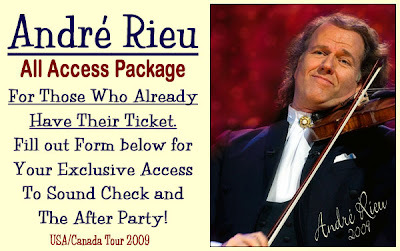 A platinum selling artist around the world, Rieu's worldwide appeal is as strong as ever having recently earned his 4th Platinum certification from Canada's CRIA for the DVD "CHRISTMAS AROUND THE WORLD" bringing his total awards to 15 to date (including 11 Gold Sales certifications). 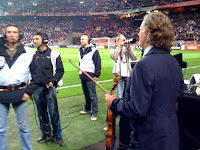 André Rieu Rock and Roll ! I laughed so hard at this ... a lot of fun to watch. ►Watch Video Rock and Rieu ! !